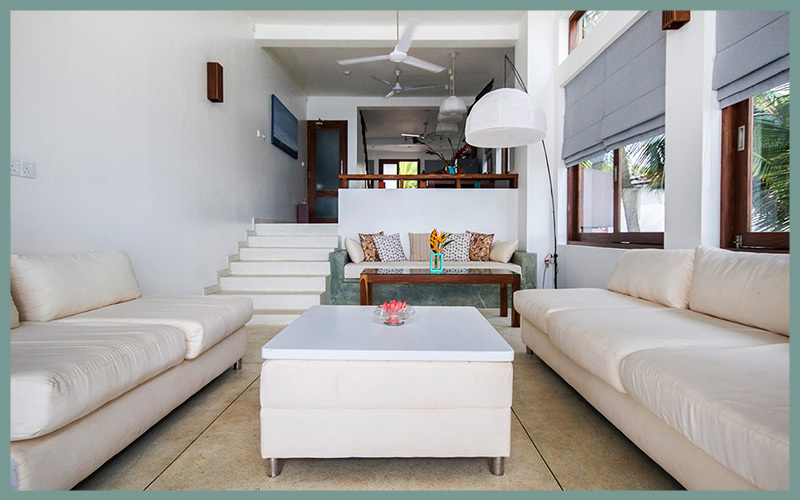 Skinny Beach House - a contemporary, stylish place with beach front. 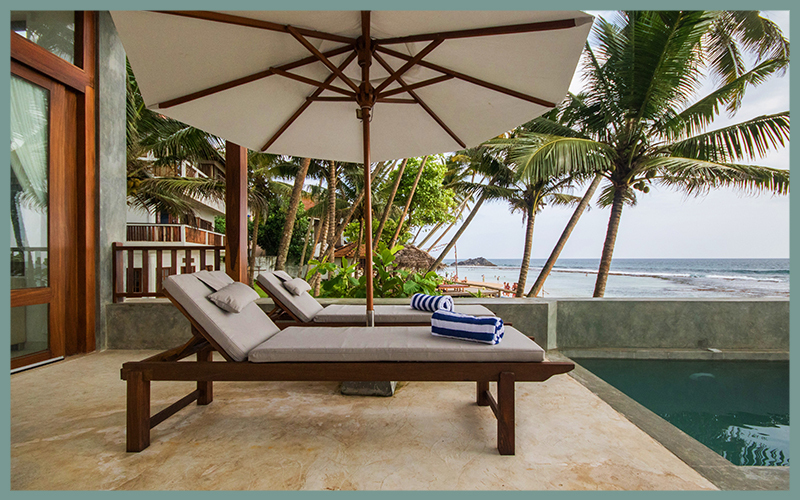 Situated on Sri Lanka’s palm-fringed southern coast, a 20 minute drive from Galle Fort, 10 minutes past Unawatuna, ‘Skinny’ is a contemporary, stylish, private house with direct beach front access to arguably one of the best beaches in Sri Lanka. Skinny beach offers an unforgettable holiday experience, the ideal place to relax and recharge away from the hustle and bustle of city life or post your island tour. Creatively designed using a long, narrow plot, the space has been fully optimised to create a spaciousand unique beach escape. Downstairs is a comfortable and stylish living space with designer furniture. Bespoke fixtures and fittings crafted from local hardwood perfectly complement the pale grey and white colour palette creating a cool and elegant aesthetic. Open sliding doors to the private sundeck to make one seamless indoor-outdoor space, ideal for either relaxing or entertaining. Steps lead directly down to the powder soft sands of Dallawella Beach, where a stunning protective reef divides a calm, sparkling lagoon ideal for safe swimming and snorkelling at one end from a fun reef break at the other. Spend lazy afternoons under the swaying coconut palms snoozing on the comfortable loungers while spotting Olive Ridley turtles, then cool down with a dip in Skinny’s private plunge pool. 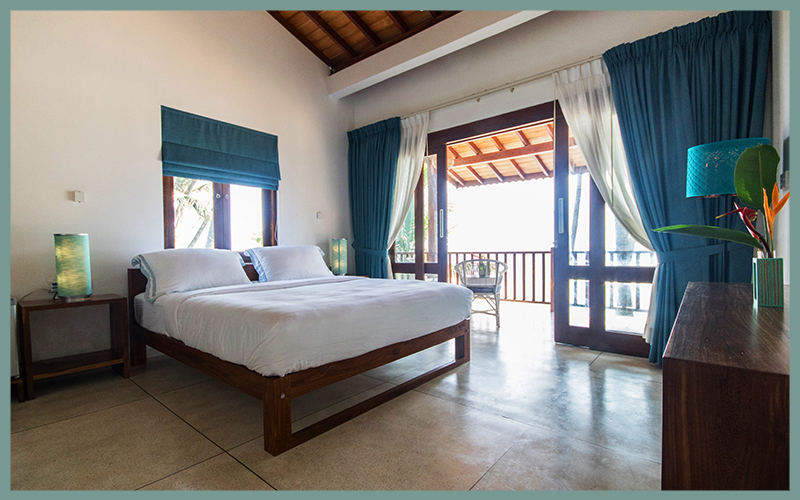 Upstairs in the property, large windows let in ample light and the front bedroom, which faces south west, offers unbeatable views from the balcony, an ideal spot to relax with a sundowner while gazing at the tequila-hues of an Indian Ocean sunset. Both bedrooms have ultra-comfortable king size beds fitted with 400 thread count white cotton linens, including micro-gel pillows. Both rooms have ample hanging space in purpose-built closets, air conditioning and personal safes; the main bedroom also has a fridge. The stunning mosaic-tiled bathrooms are super-spacious with ultra-high ceilings, well stocked with plenty of fluffy white cotton towels and organic toiletries. The bathrooms also boast large vanity units and oversize shower heads. The well-appointed kitchen has all the usual modern amenities, including a small cocktail bar and a Nespresso coffee machine. It is fully equipped with cooking utensils should you wish to prepare a meal, or Sashi, our house manager, can cook you a variety of traditional Sri Lankan and western dishes on request.